Piano virtuoso Ludmil Angelov is renowned for his musicianship in concert halls, on radio, on television and on recordings. Maestro Angelov’s considerable work playing Chopin alone has earned him many accolades and awards. Since 1992 he has lived in Spain, where he is the Founder and Artistic Director of Toledo International Music Festival. 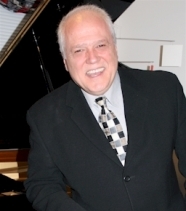 He teaches at Toledo Conservatory and also gives master-classes at Castellón Conservatory. In 1994 he was unanimously awarded First Prize at the World Piano Masters International Competition of Monte-Carlo. Marking a turning point in his career, this prize enabled the young pianist to perform at many of the most important concert halls of Europe, enjoying both audience and critical success. Ludmil Angelov was born in Varna, Bulgaria, into a family of well- known musicians of Bulgarian and Greek descent. He started taking piano lessons at the age of six and soon made his debut in Sofia and other Bulgarian cities. Mr. Angelov graduated with an Honors Degree from the Bulgarian State Academy of Music, where studied with eminent pianist and pedagogue Konstantin Stankovich, former assistant of the legendary Nadia Boulanger. Ludmil Angelov has won prizes and distinctions at many international competitions, including “Virtuosi di Musica per Pianoforte” (Czechoslovakia, 1973), “Senigallia” (Italy, 1976), “F. Chopin” (Poland 1985), “Palm Beach” (USA1990) and “World Piano Masters” (Monte-Carlo 1994). Having embarked upon an international career, he has been to all European countries, USA, South America, Hong Kong, Korea and Taiwan, appearing in countless recitals, chamber music concerts and as a soloist with many major orchestras, including the Covent Garden Orchestra, Monte-Carlo Philharmonic Orchestra, Berliner Sinfonieorchester, Schleswig-Holstein Sinfonieorchester, Russian State Symphony Orchestra, Russian Radio Symphony Orchestra, European Masters Orchestra, Orchestre Philharmonique de Montpellier, Orchestre Philharmonique de Marseille, Orchestre Lamoureux, Orquesta Nacional de España, Orquesta Sinfónica de Madrid, Orquesta Sinfónica de RTV Española, Orquesta Ciudad de Granada, Lithuanian State Symphony Orchestra, Athens State Orchestra, Sofia Philharmonic, Bulgarian Radio Symphony Orchestra, etc. Among many others, he has been conducted by M. Andreae, E. García Asensio, P. Bride, J. DePreist, L. Foster, V. Ghiaurov, N. Gum, P. Halffter, D. Jaeger, M. Natchev, G. Pehlivanian, J. B. Pommier, J. Pons, R. Raytchev, Y. Sado, G. Schneider, E. Tabakov, G. Rinkevicius, etc. During the 1987/1988 season, Ludmil Angelov performed, in a cycle of 12 recitals, The Complete Piano Music of Chopin. For this unique event he has been awarded “Musician of the Year of Bulgaria”. Consequently, he has appeared at some of the most important Chopin Festivals. 1990 saw his debut recital in New York, at Lincoln Center. He also appeared at the Berlin Philharmonie Hall, Salle Pleyel and Salle Gaveau of Paris, Concertgebouw of Amsterdam, Herkulessaal of München, Opera of Monte-Carlo, Opera of Marseille, Corum of Montpellier, Auditorio Nacional de Madrid, Auditorium of Barcelona, Palau de la Música de Valencia, Concert Hall of the Moscow Conservatory, Concert Hall of the Milan Conservatory, Palace of Music of Athens, KBS Auditorium of Seul, etc. In 1995 Mr. Angelov was invited by Prince Rainier of Monaco to perform at the Palace of Monaco as a soloist with the Monte-Carlo Philharmonic Orchestra. Ludmil Angelov has recorded for RCA, Pentatone Classics, Gega New, France Classique and Subi Classics. His live performances have been broadcasted on Bulgarian, French, Spanish, Polish, Hungarian, USA and Korean television and radio stations. In 1999 he performed The Complete Piano Music of Chopin at the Conde Duque Auditorium in Madrid, as well as in Palma de Mallorca, Valencia and Gijón. In 2000 Mr. Angelov performed with renowned Ensemble Laureate during its summer tour in Spain, and among his solo appearances are his recitals at “La Roque d’Anthéron International Piano Festival” and Warsaw International Chopin Festival. In 2002 Ludmil Angelov made his Newport Festival debut appearance and was immediately reengaged for next year’s edition of that festival. His last CD recording of Chopin’s Complete Rondos &Variations has been awarded recently with the “Grand Prix du Disque Chopin” by the International Chopin Institute of Warsaw, along with the CD of Chopin’s Piano Concerti recorded by Krystian Zimerman. Most recently, the Dutch label, Pentatone, released his Gershwin Super Audio CD, recorded with violinist Vesko Eschkenazy and members of the Royal Concertgebouw Orchestra of Amsterdam.